The headlines at yesterday's Apple event were largely dominated by the new gorgeous 5K Retina Display iMac as well as new Apple iPad tablets. However, you'll have to refer to the company's press release and website to discover that it also released a new version of OS X server (version 4) and quietly retired the Apple Mac mini with OS X server. Google still shows the search result for "apple mac mini server" but the page has disappeared from Apple's website. The new OS X Server 4.0 requires Yosemite - which means that it is likely to be a "superset" of features rather than an OS on its own - and is available from Mac App Store for £13.99 ($19.99, AU$21.99). Apple has also rolled out an up-to-date program for OS X server which allows qualifying Mac mini purchasers to get the server OS for free. Will Apple eventually "kill" OS X Server by offering it as a free add-on in the near future? As the French say - c'est possible. 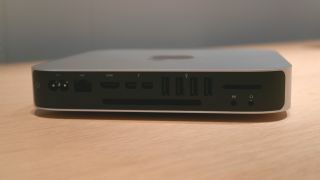 As for the Mac mini, its future might follow two distinct paths; either Apple kills it like it did for the Xserve several years ago or it will be the next one to be switched from Intel to ARM (like the Apple TV). As it stands right now, the fact that it has cut the price of the Mac Mini and is positioning it as a stand alone desktop (rather than a server), leaves us to believe that that an ARM transition is imminent. The new model supports up to 1TB of storage rather than 2TB, and It's also worth noting that while Apple has unveiled a 5K Retina Display iMac (essentially an all-in-one PC), it didn't announce a stand alone monitor with similar capabilities.